The idea of "Mind Over Matter" is, more often than not, generally associated with the paranormal phenomenon known either as telekinesis or psychokinesis - which is, as is indicated by the term, "the direct influence of mind on a physical system that cannot be entirely accounted for, by the mediation of any known physical energy (i.e. moving objects with the mind)." 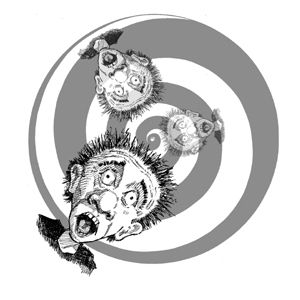 Notwithstanding the general use of the term: "Mind over Matter", as previously stated, its association with so-called paranormal phenomena is not the subject of this discourse. Rather, the information which subsequently follows is intended to treat the subject of Mind over Matter from the standpoint of what might aptly be called spiritual science, regarding whether there is any basis for supposing that Mind (or rather, Mental Action) is able in any way to exert influence the existence and operation of Matter - either directly or indirectly - and, on the supposition that such a basis exists, to offer suggestions for what might be considered the safe and beneficial exercise of any power or influence of Mind over Matter. The uninstructed person may find such a proposition to be humorous, but a little consideration would show, that a world where each and every person could exercise any power of Mind over Matter at will, without any unifying principle or principles to guide the exercise of such power, would be a very dangerous place in which to live - let alone exist - as any conflict of will or intention between individuals could literally lead to the destruction of such a world. It can be recalled from the discourse on Mind Power that the Original Creative Power, or Universal Mind, possesses and demonstrates at least one attribute that is apparently absent from other forms of energy (light, heat, sound, etc.) - namely, Intelligence. In addition, it was first mentioned in that same discussion - and perhaps expanded further in the discussion on Outward Manifestation - that each and every form of life, from the so-called First Kingdom (inanimate matter) to the Fourth Kingdom (the human species), may be considered a particular manifestation of Universal Mind; the differences between any particular lifeform and another being: (a) the body or physical vehicle associated with any particular lifeform, and (b) the level or degree of Intelligence demonstrated by any such lifeform. Going further, it was also revealed in previous discussions that a human being may be considered as more than a mere manifestation of Universal Mind - rather, and from a philosophical or metaphysical standpoint, Man may be more accurately described as an Individualization of the Universal Mind. And, in comparison to all other forms of life (inanimate matter, plant life and animal life), Man essentially constitutes the highest degree of Intelligence among all terrestrial lifeforms. Now, it is an established fact, demonstrated by physical science, that, where more than one force acts upon a body, there is a resultant force, which ultimately determines the resulting mode of motion of that body, and which, as mathematics demonstrates, is greater than any of those individual forces. Next, we may avail ourselves of what is generally referred to as the Law Of Continuity, a philosophical principle which essentially dictates that: if some law or principle exists and operates on one plane, it likewise exists and operates - perhaps in some other form, but it exists nonetheless - on any and all other planes. And, from our previous discourses, it can be established that there are really only two planes of being - the physical plane (that of the Relative), and the spiritual or non-physical plane (that of the Absolute). And it may be recalled that on the spiritual plane - the realm where Spirit or Universal Mind may be said to subsist - there is only one conceivable mode of action - namely, Thought or Mental Action. We may now go further and draw upon another principle, which may be considered as belonging to spiritual science, rather than to physical science - that of Collective Intelligence, which essentially states that, in any collective body, there exists not only the Intelligences associated with each of its component parts, but there also exists a resultant or Collective Intelligence. 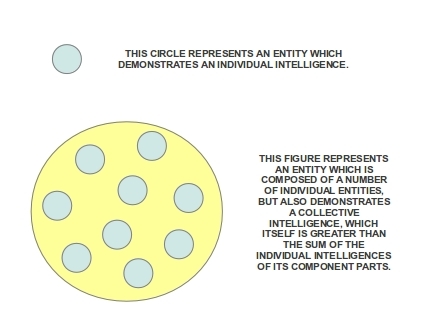 This Collective Intelligence does not so much belong to any of the individual components that make up the collective entity, but rather to the collective entity. 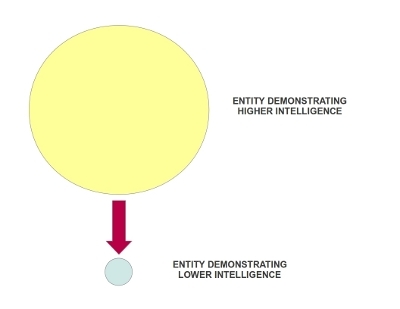 And, both by reasoning as well as by observation, it has been established that this collective intelligence is a higher mode or manifestation of intelligence, compared to those of the component parts, and is therefore capable of exercising control over each and every manifestation of intelligence lower than itself, in accordance with another principle which states that "the higher mode of intelligence controls the lower". As to how it is that a higher mode of Intelligence may control a lower mode, here is a possible explanation, which may ultimately lead us to realize the power of Mind over Matter as an actual fact. Now, Universal Mind or Spirit possesses and demonstrates another attribute, that is, once again and so far as observations to date suggest, not demonstrated by any other form of energy - that of Responsiveness. Responsiveness is, as the term implies, the measure or degree to which an entity reacts or responds to some form of stimuli or influence. It is also worth noting that Intelligence and Responsiveness are related to each other - specifically, Responsiveness is the means by which Intelligence manifests itself, or makes itself perceptible. Accordingly, in the same way that Universal Mind has been deduced to constitute what might be deemed Infinite Intelligence, it may also be deemed to demonstrate Infinite Responsiveness. And, by virtue of Universal Mind existing - or rather, subsisting - independently of time and space, Infinite Responsiveness can only be rationalized to imply Instantaneous Responsiveness. From our previous discussions, it has been established that all forms of Matter are ultimately individual projections or manifestations of the Original Creative Power, or Spirit. Then, we can logically conclude that, notwithstanding the particular form, the Intelligent and Responsive nature of Spirit is actually present in each and every form of Matter, in accordance with the maxim that Spirit is the Power which knows itself. Consequently, Spirit recognizes itself in and through all degrees of manifestation, even if the entity which constitutes a particular degree does not itself demonstrate awareness of this recognition. Thus, any exercise of Thought or Mental Power by a higher degree of Spirit, must lead to a response by any and all lower degree of Spirit. And since, on the evolutionary scale, Man constitutes the highest degree or manifestation of Spirit, then his exercise of Thought must being about a corresponding response by all degrees of manifestation lower than himself, i.e., animals, plants and inanimate matter, or, so-to-say, everything else in his individual world. There exists a rather simple example of that principle ("the higher mode of intelligence controls the lower") which has been observed and deduced from medical science. Consider a scenario where two persons are, so-to-say, hospitalized and suffering from some particular disease. They do not have sufficient strength or vitality to return to a so-called "normal" lifestyle, but, for the most part, the individual organs of their bodies are carrying out their various functions, either normally, or as best they can, under their particular circumstances. As time progresses, one patient, via whatever means, takes on the suggestion that he (or she) will recover to full health - while the other takes on the opposite suggestion that they will die as a result of the disease. In accordance with the accepted suggestion - a topic in itself, which shall be presented in more detail, later on - the one who takes on the suggestion of recovery, eventually recovers, while the one who took on the suggestion of dying, inevitably succumbs to death. What might be considered interesting about the example, is that, up to the moment of accepting a particular suggestion, the patients' physical bodies were, for the most part, operating in their natural manner, but as soon as the highest mode of intelligence associated with each patient - namely, their individual mind, working through the brain - accepted a particular suggestion, the physical body and all its components (which may be considered lower modes of intelligence, as compared to the mind) responded accordingly to the accepted suggestion. The preceding arguments make it possible to substantially account for all claims that have ever been made, across virtually all schools of religion and philosophy, that Man's Thought possesses Creative Power, of the same exact quality as that which brought all creation into existence, and by and through the exercise of his inherent power of thought, each Individual may set in motion one or more series of causation, that ultimately direct all that occurs or transpires in his individual world. Expressed another way, Man, by virtue of his innermost nature, possesses the ability to exercise the power of Mind over Matter, to indirectly, yet surely, mold and shape his individual world, into virtually any form he may choose. But here the Author is obliged to lay emphasis that, as previously stated, any power of Mind over Matter which Man may exercise through his creative power of thought, as outlined in this discussion, works indirectly, rather than directly. This is because, as previously mentioned in the discussion on Anima Mundi, the exercise of the power of Mind over Matter sets in motion a process of Creation, as opposed to that of Construction. And, as was previously mentioned, there is a difference between the two processes - one which the reader would do well to grasp. At this point, it may prove useful to the reader who might be encountering this subject for the first time, to avail himself or herself of at least two examples of the influence of Mind over Matter - there indeed may be others, but if what is presented here makes sense, the reader is free to do his or her own investigations. In all likelihood, we have all heard of the concept of "talking to plants" in order to stimulate or accentuate their growth, and various experiments and observations have been conducted to discover the basis of this proposition. Some of those experiments and observations tend to support the hypothesis that plants can and do respond to sounds - whether that of the human voice, or any sound recorded and reproduced via suitable apparatus. It is possible to trace out an argument, based upon much - if not all - that has been previously discussed, that the plant is not so much responding to any sounds being directed towards it, but rather, to the mental action of Man, on the basis of the principle stated earlier - namely that the higher mode or manifestation of Intelligence (Man) controls the lower (plant life). Another example of the power of Mind over Matter - and one that will be expanded on further in another section - is related to the phenomenon of hypnosis. Simply put, it has been established by (literally) thousands of experiments and observations performed all over the globe, that various bodily conditions may be simulated in an individual, whose body does not demonstrate the particular condition, under so-called "normal" operation, when he (or she) is put into a hypnotic state, and thereby impressed with the suggestion that some particular condition is present in their body. Once again, it can be traced out via much of what has been previously discussed that the physical body of Man, even though composed of atoms, molecules, tissues and organs, demonstrates a lower degree of intelligence than the Mind of Man. Consequently, and in accordance with the maxim that "the higher mode of intelligence controls the lower", the suggestion, once resident in the mind, inevitably leads to the manifestation of that suggestion, as a corresponding fact, in the physical body. And, notwithstanding that it was mentioned previously, it is well worth stating again - it has been deduced that Thinking is a perpetual process - and that, as a consequence, each and every person is, either consciously or unconsciously, formulating some thought or idea, and subsequently, broadcasting said thought or idea, thus giving rise not only to the exercise of the power of Mind over Matter in the individual's own world, but, in conjunction with the cumulative mental impressions of millions (or billions) of other individuals, also giving rise to what might be considered a mass mental impression, which - again, based on much or all of what have been previously put forth - leads to the manifestation of the power of Mind over Matter upon of the entire world, or universe. This leads us once again to the proposition that Man can either let his mental instrument "run wild" without any restraint or guidance, or seek to consciously and deliberately direct his power of thought - and by extension, his influence of Mind over Matter - towards some beneficial or useful purpose. In the next discussion, the idea of such conscious and deliberate direction of Man's creative instrument of Thought - which, in turn, leads to conscious and deliberate exercise of the power of Mind over Matter - shall be explored and expanded upon further.